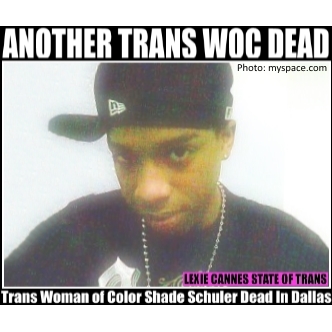 LEXIE CANNES STATE OF TRANS — Dallas, Texas police identified the severely decomposed body discovered in a field near Dallas’ Medical District on July 29th, 2015 as of Shade Schuler, a transgender woman of color. Due to the state of discomposure, it took 2 weeks for the medical examiner to identify the body, the victim’s race and point to a cause of death — at least one report states the victim was shot to death, motive still unknown. At this writing an exact date of death is not available and apparently, no suspects. As of Oct. 27, 2015, there are still apparently no suspects. According to Lone Star Q, Trans Pride Initiative’s Nell Gaither, assisted with the identification of the victim’s trans status. No kind of spinning is going to rid us of the elephant in the room — TWOC lives are being snuffed out at a disproportionate rate. Cause: Hatred AND racism. If it was just hatred, white people would be leading the death tally here in the United States. If there ever was a compelling case that racism still exists in the U.S., this is it. Without more information about the killers of trans woc, I am hesitant to call these murders racist. Are the killers perhaps also black? Maybe you have data on solved cases. Can you fill this gap in my knowledge? This is really sad that yet another senseless killing of a TMOC has happened. These people who do this are Godless people and they will never find peace, ever! When will this ever end? Even on the show I am Jazz, the story of the now teenage transgender girl interviewed by Barbara Walters many years ago she was following You Tube videos that she had posted and found deaththreats to her. Three words need to be said, Stop the hate! For such a young kid, Jazz is very brave. I’m amazed at the talent and presence that Jazz has when I see her on the television. She’s a natural. I hope she continues to bring the general public towards a better understanding of who we really are. I also hope she has been able to inspire the young transgendered youth to come out and that it does get better. But what of internalized homophobia? I see that as more likely inspiration for violence. I shall investigate the internalized racism angle, thank you for your comment and link.